Mega Bloks 1-2-3 Count! Bag Just $6.10! Down From $19.43! You are here: Home / Great Deals / Mega Bloks 1-2-3 Count! Bag Just $6.10! Down From $19.43! Amazon has this Mega Bloks 1-2-3 Count! Bag on sale for $6.10 (Reg. $19.43)! 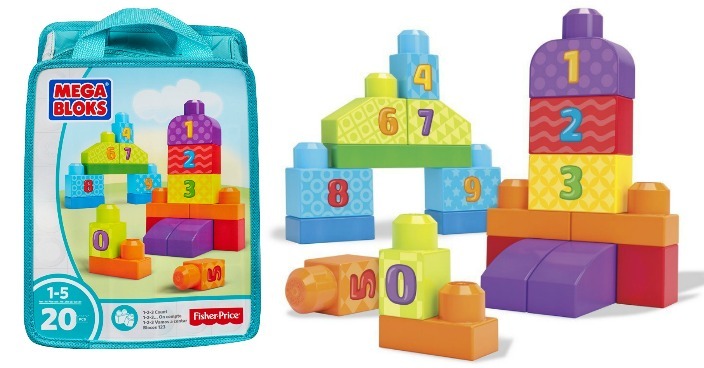 Building and numbers add up to big fun with 1-2-3 Count by Mega Bloks! Now your little one can learn to count to 10 when they start building with 20 award-winning blocks that you can decorate with the numbers 0 through 9. Use the brightly colored blocks and special shapes to make tall towers, rows of numbers, or anything else you can imagine. When the counting is over, cleanup is as easy as 1-2-3 with the convenient storage bag! Ideal for ages 1 to 5.